Now that Toronto has a production of War Horse equal to those in London and New York, it goes straight to the top of any must-see list for Toronto. The question is not if you should see the show, but when. My answer is, “The sooner the better because you may very well want to see it again”. I saw the show at the National Theatre in London in 2007 and 2008. Seeing it in Toronto for the third time only made me realize how the show still overwhelms you with its brilliant concept and grows with meaning on every viewing. 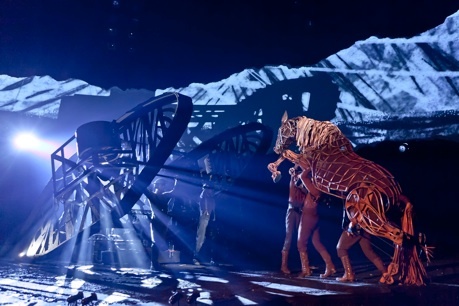 War Horse is a unique theatrical experience that will appeal both to frequent theatre-goers and those who are not. The reason is that the show combines drama and spectacle in a completely natural way so that each heightens the effect of the other. The scale of the show runs from simple folk-tinged songs sung from a “Song Person” alone on stage to epic, frighteningly effective depictions of battlefield strife. The epitome of the link between drama and spectacle is the presence alongside human beings of full-sized horses on stage, each a magnificent puppet manipulated by three puppeteers--one for the head, one for the heart and one for the hindquarters. While it is understandable that there has been so much publicity about the show including photos and videos, it is also a pity. When I first saw the show in London, all I knew was that it was about a boy looking for his horse during World War I and that the horses were played by puppets. Having seen no photos I was completely unprepared for the incredible inventiveness of these creations or for the unbelievably realistic detail that the three puppeteers working as one can achieve. Photos and videos can only show you the rudiments of what is there--one person apparently leading the horse and the legs of the two people inside a cloth, metal and wicker form shaped like a horse. What they cannot show is the transformation of these rudiments in the mind of the audience member. As in other fine puppetry--whether in the marionettes of Ronnie Burkett or in the one-third life-sized puppets of Japanese bunraku, also manipulated by three people--a magical change of perspective occurs where the presence of the puppeteers fades in the mind and we focus on the puppet itself as if it were a living, independently acting being. This is the kind of magic that can only happen in live theatre. The principal horse of the show--Joey, a draught horse, thoroughbred mix, and Topthorn, a pure thoroughbred--have been beautifully designed, built and directed by Adrian Kohler with Basil Jones for the famed Handspring Puppet Company. Kohler and Jones have trained the Canadian cast to observe minutely the behaviour of real horses and literally to breathe and act as one being. The result is absolutely uncanny. From ear and tail twitching to stamping and snorting to majestically rearing upward to the characteristic of twitching the withers to remove a fly, these horses don’t act as much as live before our eyes. The play is based on the 1982 children’s book of the same title by Michael Morpurgo. The book is narrated by the horse Joey. In his adaptation, Nick Stafford has the two “Song Persons” (Melanie Doane and Tatjana Cornij) act as a kind of chorus, setting the action within the cycle of the seasons, praising the bravery of soldiers and lamenting their loss. What Stafford distills from the book and directors Marianne Elliott and Tom Morris make so clear in their direction is the fundamental irony of human interactions. Years before war is declared, there is strife in a small village in Devon between two brothers. Arthur Narracott (played with sneering superiority by Richard McMillan) and his brother Ted (given a pathetic air by Brad Rudy) hate each other. The nominal reason is that Arthur fought in the Boer War and Ted did not, thus leaving himself open to Arthur’s taunting him as a “shirker”. The question Arthur can’t answer is what would have happened to their farms if both had gone to war. The most salient example of this rivalry is their virulent competitive bidding on the foal Joey. Ted “wins” but only by using up all the money for his mortgage. Ted’s wife Rose (sympathetically played by Tamara Bernier-Evans), frustrated by her husband’s continual foolishness, agrees to keep the horse only if they will sell it later and if their son Albert (in a fine portrayal by Alex Furber) agrees to bring it up. Albert is thrilled and the first section of Act 1 concerns the bond of trust he manages to forge between himself and Joey. The essential irony of the play is already evident. Two brothers urge each other on into financially destructive behaviour while trying to promote their status within the community, while two members of different species, free from societal pressure, create an understanding that will last a lifetime. When war is declared between England and Germany it is magnification on an international scale of the strife between the Narracott brothers. Ted’s weakness (so well brought by Rudy) leads him to sell Joey to the army as an officer’s horse just because he will make a profit. Albert learns that Joey and other local horses will be shipped to France, vows to find him and lies about his age to join the army to do so. Joey then has two more owners. First there is the heroic Captain Nicholls (a blustering Brendan Murray), who leads Joey, Topthorn and other horses in a charge against German troops with machine guns, mortars and tanks. The ignorance on all sides on what kind of war they were fighting could not be more horrifyingly evident. Riderless, Joey and Topthorn find their way to a French farm where only the small girl Emilie (well played by Addison Holley) seems resident. There the German Captain Friedrich Müller (in a winning performance by Patrick Galligan) comes across the two horses and is happy in seeing Emilie and the horses to have encountered something beautiful in the midst of the horror of war. His attempt to communicate with Emilie, neither speaking the other’s language, was much clearer in the original production where he spoke in German and she in French. Here it is quite tricky to make that point and show it as parallel to Albert’s attempt in Act 1 to gain the trust of Joey as a foal. It’s symbolic that Müller should wish to disguise his identity to protect Emilie, Joey and Topthorn since he no longer sees himself as part of a political machine that regards them as “enemies”. War Horse is not a “Boy’s Own” adventure but a heart-wrenching tale of real people, and animals, at war. When Joey, terrified, strays alone into no man’s land and when Albert, sole survivor with his friend Davey (Patrick Kwok-Choon, an empathetic and grounding presence) after an ambush, loses his hope and descends into despair, the effect is deeply troubling. Just because this is a play with puppets does not mean it is for children. Mirvish Productions recommends that children be at least ten years old to see it. This is wise since much of the scenes of battle and its aftermath may be too intense and disturbing even for some adults. The depiction of horror is necessary, though, since the play is ultimately about how individual person-to-person friendships and human-to-equine bonds can survive in a world seeming bent on annihilation. The production itself is beautiful. Rae Smith’s set and costumes capture the time period with precision. Her charcoal illustrations, projected above the acting area on what looks like a strip torn from Captain Nicholls’ sketchbook, add the art of drawing to Paule Constable’s wonderfully moody lighting, Adrian Sutton’s soaring orchestral score to the exceptional acting and puppetry. This exquisite combination of all the theatre arts is what makes War Horse such an extraordinary piece of theatre. It would be smart to bring a handkerchief to the show. I’ve seen both men and women brought to tears by the feelings of love and loss it so strongly evokes. There are tears of sadness certainly. But what is impossible to repress are the overwhelming tears of joy. Photo: (top) Alex Furber with Adam Cook as Joey; (middle) Canadian cast of War Horse. ©2012 Brinkhoff/Mögenburg.